Order your Casio LK165 61 Key Lighted Portable Keyboard with Power Supply from AMS and enjoy 0% Interest Payment Plans, Free Shipping, Free Extended Warranty & 45 Day Money Back Guarantee. 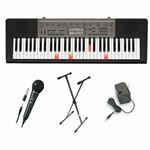 The Casio LK165 61 Lighted USB Keyboard is a great portable keyboard for beginers and experienced players alike. The full size keys light up as you are playing, up to four keys light up at a time. The Casio LK165 61 Lighted USB Keyboard with PS is portable, so you can take it with you when you're on the go. It has 110 built in songs, including 20 practice songs for those learning to play. The Casio LK165 61 Lighted USB Keyboard also has 400 built in tones and 150 rhythms.